You may think personal bankruptcies are the result of job loss or wild credit card spending. "That's why President Obama is so focused on health reform this year," she said, "lowering costs for those who have coverage already so that we can keep the coverage we have, keep the doctors we have, but also to provide some coverage and some payment for the millions of Americans -- close to 50 million -- who have no insurance coverage at all." Sebelius said there's a bi-partisan effort in Congress is to create a "health exchange" the would provide a marketplace of coverage options for Americans. She said a public option would be side-by-side with private plans. She added the plans would give people with or without coverage a choice. "Americans who have coverage they like (can) keep their coverage, (and it) will help employers move forward, she said. "But for others, they'd finally have a choice, and we'll have some competition in the market, which will lower more costs overall." Co-anchor Harruy Smith asked if the system can be fixed, particularly with the $1 trillion price tag attached to the plan. 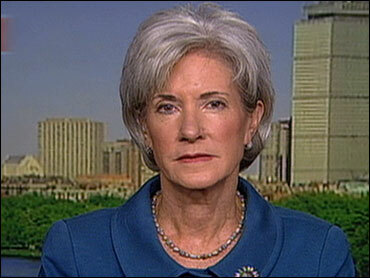 Sebelius said the focus is on lower costs overall. "If we can drive toward health, to health and wellness, make sure that people intervene early, and get the right care at the right time, overall costs will come down," she observed.